“We Can Do It” – Our tribute to all the Rosie Riveters and the passing of the model for Norman Rockwell’s Rosie – Mary Doyle Keefe. Thank you all from Estate Sales News. Many estate sales are starting today or tomorrow. Here’s a peek at some and include click throught links for you to look at the entire sale. If you are considering an estate sale, this is an excellent opportunity to visit a sale and see how the estate sale company works. Long Grove March 26, 27 & 28th, 2015 from Jeanette McBeth on Vimeo. 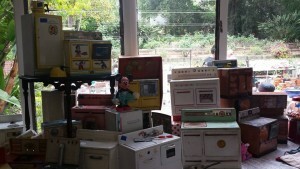 This estate sale starts today at 10am-4pm at 2501 Lincoln Ave, Long Grove, IL. by Platinum Estate Sales of Distinction LLC. 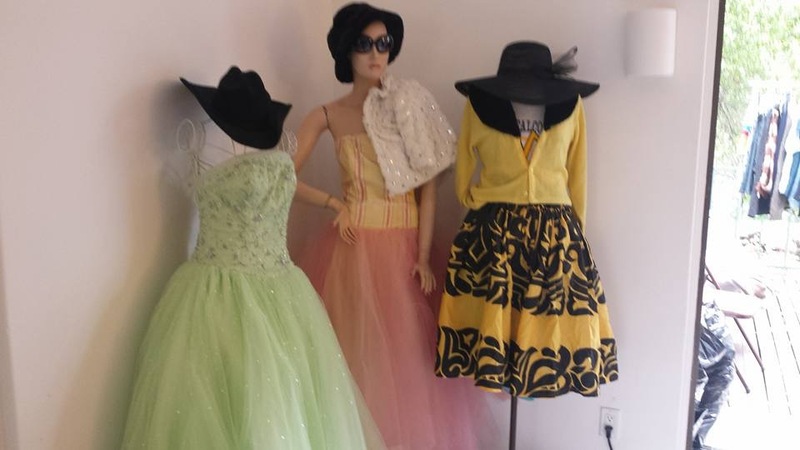 Over 500 dresses in total. A news worthy estate sale. by Jeanette McBeth. To view more pictures Click Here. One of the most unusual estate sales ever will be held in Valley Center, CA, March 4, 5, 6, and 7. The owner built an entire western town on his property and spent 30 years filling it with unique, vintage, and antique items according to Leslie McLaughlin, owner of Strictly Business Services based out of Temecula, CA. The property has been used as a movie set and for commercials. The sale includes a general store, mail and telegraph office, jail, barber shop, printing shop, saloon, vintage gas station, barn/workout room and silver saddle/spurs. 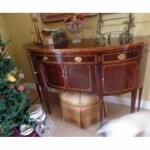 There are 180 photos to look at on Estatesale.com so click here for a direct link. Here is another link to a Yahoo article too. We are already starting week three of February 2015 and estate sale companies are busier than ever. With the competition for buyers and sellers increasing daily hundreds of estate sale companies are now using videos to attract the attention of buyers and sellers. This is truly a great form of advertising. It is important, however, to keep them within two to five minutes, showcase interesting items at the sale, and include either commentary or music that complements what will be available for purchase. Let’s take a look at some recent videos from estate sale companies using this form of advertising. Here we show three videos from various estate sale companies showcasing their sales, a video testimonial from a seller, and a video from an estate sale company explaining to buyers how to attend their estate sales. This video was from an estate sale conducted Four Sales Ltd., Daniel Sanders, Alexandria, VA.
From Xcntric Estate Sales in Chicago here is another video for a late January, 2015 estate sale. 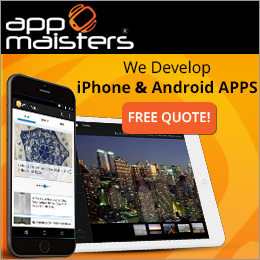 Here is a good way to showcase the work you do for sellers. 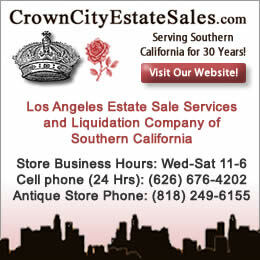 A video from Crown City Estate Sales in southern California. From Blue Moon Estate Sales in the Triad of North Carolina a video for buyers (less than 2 minutes) how to attend one of their estate sales. 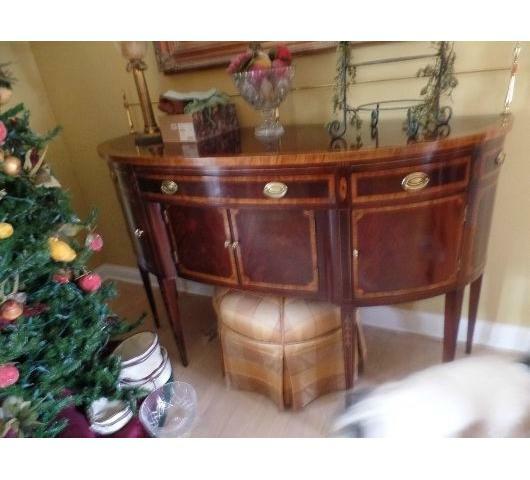 With Christmas eve less than a week away Estate Sales News wants to look back at what was under the tree this year for us and our estate sale going audience. This truly is a labor of love and we have enjoyed all the opportunities it has presented. In February 2014 Estate Sales News flew to Memphis, TN to report on the 2014 Estate Sales Conference sponsored by EstateSales.Net and we were a guest speaker at the conference discussing the basics of the estate sale contract. Since late February we have presented many articles on this most important topic and answered numerous requests from sellers and estate liquidators for more information, keeping in mind we are not an attorney and we do not give legal advice. We have been to California on several occasions to report on a variety of estate sales including one with the crown of a granddaughter of Queen Victoria, a massive sale of multiple collections from a National Geographic photographer and Indian Agent from the 1920’s to name a few. We have also covered two estate sales (one including an auction) in Michigan. A fantastic collection of Mid-Century Modern furnishings, Jensen sterling, art glass, and more in Midland and another sale that included a large taxidermy auction in Portland, MI. We had the delightful pleasure of visiting with Judy Martin, nationally known appraiser and estate liquidator at a fabulous sale in a Chicago suburb who provided great information about the estate sale industry and what’s selling as well as her sale for a famous Chicago artist. Along with our travels, we have interviewed several estate sale companies across the country with unique sales, spoken to the owners of several national estate sale listing websites about the changes they are making to their websites to meet the increasing needs of a rapidly growing liquidation industry and the evolution of the estate sale business. 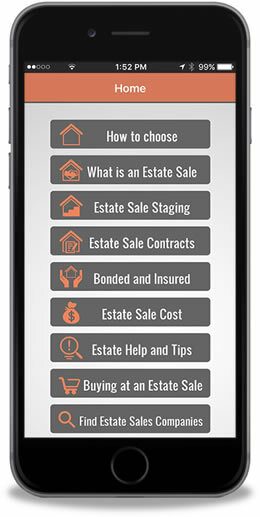 One of our larger projects this year was writing about How To Choose An Estate Sale Company. We covered in depth what to look for as well as providing a printable list to assist you in the process of finding and hiring an estate sale company. Estate Sales News has featured articles on the sale of ivory, sales tax, inheritance tax, as well as featured guest articles from Julie Hall, nationally known owner, director of the American Society of Estate Liquidators (ASEL), Lofty.com (a new way of liquidating items that may not be a perfect fit in an estate sale) and of course we have produced many videos from estate sales and liquidation specialists and appraisers. We have also been been included as a resource by EstateSales.Net for the 7,000 companies listed with them and shared our information with ASEL and other online resources. Along with good news we have reported on some estate liquidation companies that were not typical of this great industry. Majolica, gesso, and ormolu were some of the educational topics we wrote about. 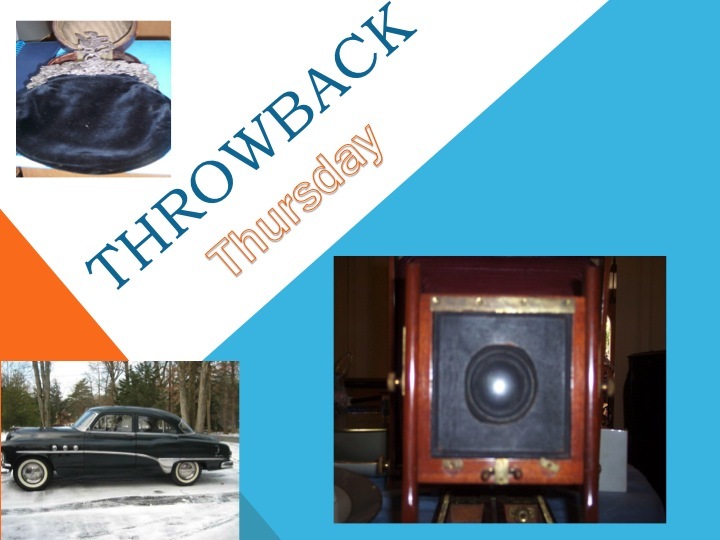 We have featured a ThrowBack Thursday feature for most of the year. 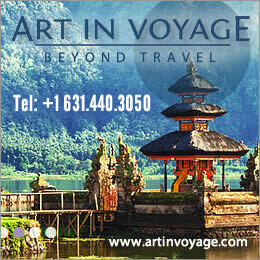 Our thanks to EstateSale.company for sharing interesting articles from their collectors corner. 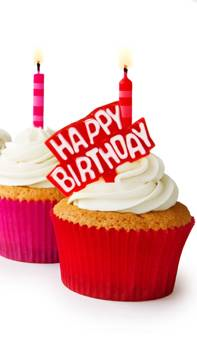 It’s been quite a year at EstateSalesNews.com and we thank everyone mentioned above along with all those who have assisted us in providing a free service to sellers looking to hire estate sale companies, buyers, and estate liquidators. As the Editor and writer for EstateSalesNews.com it is with great pride to share this overview of some of what we have provided to our audience. We will be taking some time now to spend with our family for this Christmas season. Please feel free to look into our nearly two years of archival information. From our house to yours EstateSalesNews.com wishes you a Christmas of joy and happiness the blessings of family and friends. 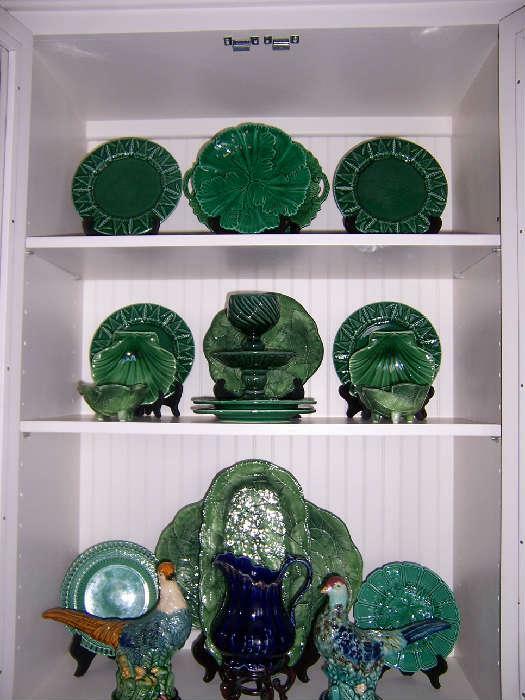 Today Estate Sales News is throwing back to the 19th century to some beautiful earthenware pottery that we call Majolica which was first created in 1851 by Mintons Ltd. in England. 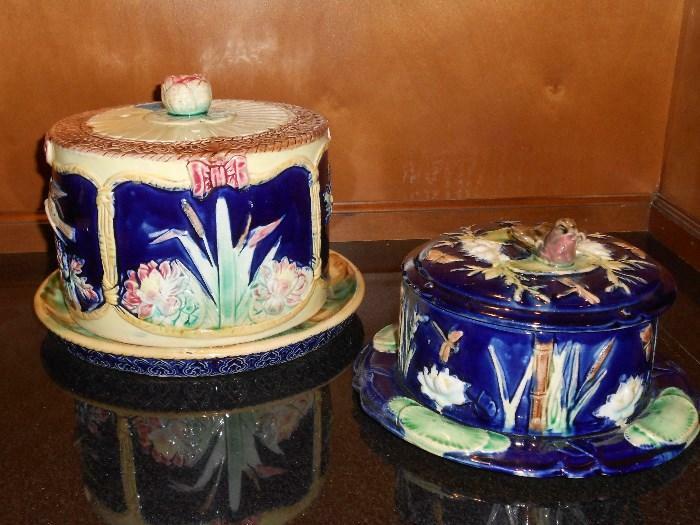 It was created for the Great Exposition then and known as Palissy ware. Palissy was a tip of the hat to Bernard Palissy a 16th century potter who used naturalistic and animal motifs with bold splashes of color. Tin glazed pottery had been made by Mintons for sometime which was opaque, white, shiny, and painted with color. This was in the Italian Renaissance maiolica which they Anglicized to majolica. Wedgwood began manufacturing majolica 10 years after Mintons and soon numerous smaller Staffordshire potteries around Burslem and Stoke-On-Trent and specialized in green majolica wares. According to Wikipedia majolica was influenced by the design of old “Cauliflower” and “Pineapple” teapots made by Thomas Whieldon. As time passed European potteries started making majolica and then it was started to be made in the United States in the 1880s’. Here is the link to the complete article, makers, and more on Wikipedia. Here are some current samples available at estate sales starting today across the country. 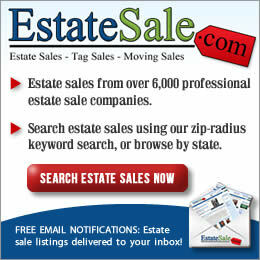 Estate Sales News looks at many estate sale listing websites every day and at 100’s of photos looking for news worthy estate sales. 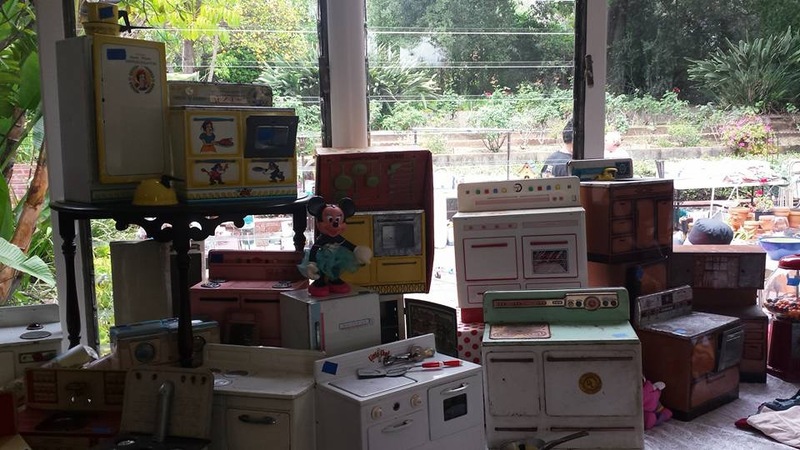 Having been an estate liquidator for 25 plus years we are use to looking at the obscene clutter and hoarding that could take place in a residence, however, buyers don’t want to see this and neither do we. Nothing is more discouraging than seeing boxes and bags and “stuff” in general in piles or heaps. It doesn’t look professional or present items that may have value or be of interest. When taking photos (even in a hoarder property) clear enough room to create a small stage to photograph some of the more interesting items. Make sure that the photos are in focus, without glare from a flash, lights or sunshine. If possible keep some dark cloth and some white or off white cloth with you to create a nondescript back drop. That old saying a photo is worth a thousand words is true and can be the most effective way to create interest in a sale. If you are taking photos of interesting items to post on listing sites, make sure you know what they are before you post. Professionalism is paramount in the estate liquidation business today more than ever before. With so many estate sale companies now in business you never know when a perspective seller is looking at an estate sale to decide whether your company should be under consideration. Good photos will help your estate sale success and that affects the financial bottom line for both parties.